Beautiful and very fragrant, French Lilacs are a favorite! 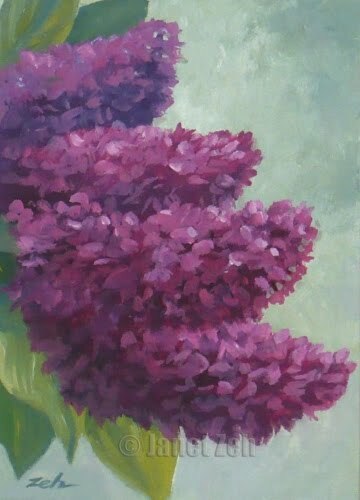 An oil painting can keep the memory of these lovely flowers blooming all year. If you would like a print or painting done just for you, use the contact link in the sidebar or bottom of this page to contact me. Thanks and have a lovely day! Was this one painted with only the three colors? The purples seem more vibrant than in your other paintings. No, I am only using the single primary palette of three colors right now with watercolors and this one is an oil painting. *chuckles* Thanks! I love art and I'm always trying to improve my own. A cool and a warm of each color ... that would give you a more vibrant palette, all right! You're making me want to go paint some still lifes.